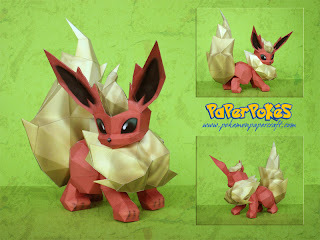 Interesting Facts: Flareon is the result of an Eevee being exposed to a Fire Stone. Out of the seven known Eeveelutions, Flareon bears the closest resemblance to Eevee. NOTES: Follow the numbers on the pieces for the suggested building order. Congratulations you are an artist your work is exceptional ..
Been waiting for this one for a while. Thanks. This papecraft isn't really that hard to make... For me, it was okay. As long as you have the Pepakura Viewer and follow the guidelines(numbers). what program do you need to view it? I tried downloading the A4 and the Letter versions but since they're both .rar files nothing I have on my laptop opens them. Rar archives can be opened with Winrar, Unrar and some others programs. I recommand looking at our FAQ page for more info. *-* Thank u so much! Flareon is my favourite, its perfect!!! @Andrea I'm a mac user also, I just use "rarexpander", very easy program :). Have some program to see it in 3D on Android? Unfortunately I don't know of any viewer for Android.